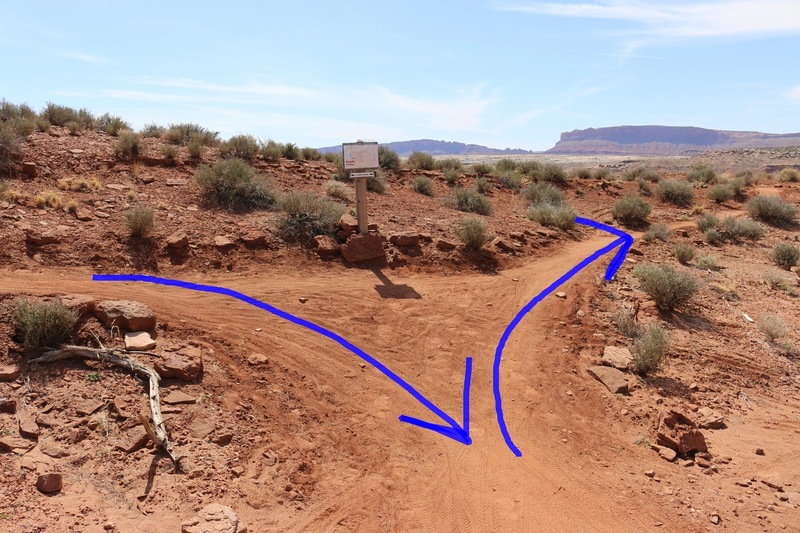 The Carousel trail is located in the Klonzo Mountain Biking Area north of Moab, Utah. The trail is in the South Section of the Klonzo trail system and is accessed by one of two spur trails that connect it to the Midway trail. The Carousel, Wizard, Magician and Gypsy trails are all part of a subgroup of trials especially built with beginning mountain bike riders in mind although most everyone seems to enjoy making a casual roll through the area. For this post we began at the Midway trailhead. 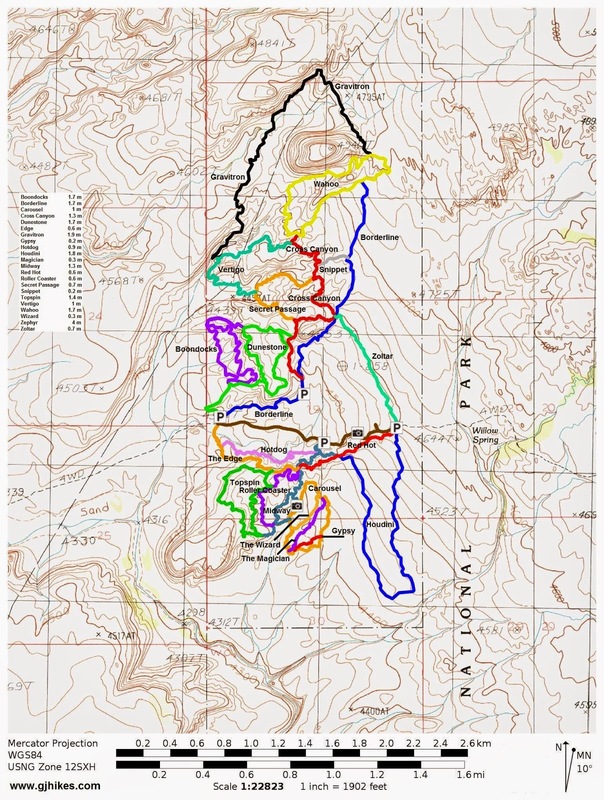 For a little help in getting to the Klonzo trails refer to the post for the Boondocks trail. Follow the Midway trail from the trailhead and take one of the spur trails that lead to the Carousel trail. For this post we took the first spur that we came to. Be sure to check out the dinosaur tracks in the wash at this point. They aren't the greatest impressions but learning to spot imperfect tracks helps to improve the chances of noticing unmarked sites as you are out and about. The Carousel trail gives riders the chance to experience both dirt and slickrock riding. The west side of the loop travels along shallow washes where mostly dirt is encountered. The second spur trail is comes up after a short distance. This one also connects with Midway and not too far from its southern end where the Zephyr and Topspin trails begin. As the trail continues it crosses a doubletrack road and shortly after that the lower end of the Wizard trail branches off to the left. Continuing around the Carousel the next encounter is with the lower end of the Magician trail. And last of all, as the Carousel begins arcing eastward, the lower end of the Gypsy trail makes its connection. As the Carousel trail bends east and then north it becomes mostly a slickrock path. Heading north across the huge slickrock flats the upper ends of the Gypsy, Magician and Wizard trails are encountered as well as the doubletrack road once again. The final piece of the trail travels along the contact point of the hillside bringing the loop to a close at the wash where it began. After completing the loop and riding up and down the other trails the Midway trail must be ascended in order to return to any of the parking areas. The Midway trail has an intermediate rating but the only real difference with it is that it has more elevation change and the washes that it travels through are deeper. We watched several families with younger children that were having a blast on all of the trails in the Carousel group. If you would like to see it for yourself then all you have to do is grab your bike or 'Take a hike'.